Suburban Pest Control specializes in all phases of Pest Control and services all size properties, ranging from private homes to large scale facilities. We are staffed with two supervisors with over 35 years of experience in the Pest Control Industry. We have six trained professionals in our office, with which we are able to provide each customer with the individualized service they require. This was my second time using the services of Suburban Pest control management because they were so professional n`effective the first time. In fact they will be my go to pest control service b/c they were informative,efficient as well as offering recommendations to combat problems.I strongly recommend this company for all your pest problems in house and outside.Simply put I`ll use them again and again as needed. Again I`m referring this company in the strongest terms. Extremely happy customer Johnny Blalock. My parents used Suburban for years and highly recommended them. We have been so pleased with their customer service . Every person who has been here has been excellent and accommodating to my schedule. The service technician, Mr. Casanova, was prompt, professional, and friendly. 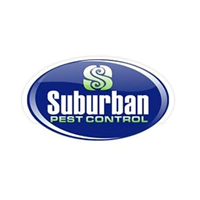 We have been a customer of Suburban Pest Control for decades and are very happy with their service. Very Friendly, knowledgeablezdx professional and accommodating. They convey a true sense Of confidence And knowledge in what they do. I would highly recommend them to friends and family. I love Suburban Pest Control because they let me live vermin free and that makes my tenants happy too. Suburban Pest Management is professional, and they are on time, communicate well, and keep my house pest-free. Your service, thus far, has helped with my bug situation. The only thing that I wish would improve is that the stuff you spray has left a white stain on my floors. There was no stain on your first visit, but there is a stain after your second visit. Great company with professional staff. Luis has kept my apartment pest free for the past 3 years! Keep up the great work! Luis has been very professional and courteous. He is a pleasure to work with. He is efficient and and thoughtful. Luis is assigned to my building. He is very professional, polite and mannerly. He exterminates where I request. Since he has been our exterminator I have not had an unwanted creature in my apartment. I hope he will be assigned to my building for many years to come. Taylor Cabassa was very professional, thorough and courteous. He completed his work quickly and further gave some advise/caution on the pesticides used, if it would or would not affect the kids. Very informative. Well done Taylor, I'd be sure to recommend you and your company to close friends for pest controlling. I always look forward to Friday afternoon at the office, Wilfredo is the best at his job, haven"t seen any critters in quiet some time. If you need a great exterminator call on him. Luis is a wonderful technician! Always professional and pleasant! Been using Suburban Pest Control since the 1990"s. Highly recommended them!! Very professional. Will recommend to friends. They were on time, friendly, knowledgeable and efficient. I had a wasp problem and thanks to Suburban Pest Management, the problem is solved. No more wasps. I would highly recommend them and I will not hesitate to use them in the future (hopefully wont need to). Thank you Suburban Pest Management. Great service, staff is understanding and kind. They got the job done at a reasonable price. They are my go-to exterminators formlife. Good service by courteous staff. Always do our mosquito spaying on expected dates & service helps control those pests in our yard. They also took care of a bee infestation last year. Highly recommend. So far so good. Always room for improvement. The tech is great though. Excellent and dependable service. Thank you. I hada problem with carpenter ants. The technicians were professional and courteous. They completed the first two treatments and came back a third time to be sure the problem was solved. I would recommend them highly. Suburban Pest Management are a great company who are reliable and get the job done. We were experiencing an onset of very tiny ants. No matter what we did, sprayed or kept clean, they continued to come back. After 1 visit the problem was greatly decreased. Leonard our technician was GREAT. This is our third visit and the ants are gone. Thank you Suburban. There is nothing worse then having your kitchen invaded by these little creatures. But you corrected the problem and we are very grateful. Pat and Liz. On time, worked quickly but efficiently. very courteous help. I only hope we do not have a repeat infestation. ET-AL Management is very pleased with the quality of service received from Suburban Pest Control. Very professional, courteous and thorough! Luis was quick and professional! I am happy with the service I have received because the amount of bed begs has greatly decreased. The only unfortunate thing is that I saw about 4 bed bugs this week and my daughter got bit. Pleasant, caring, expert technician arrived on time and provided eco friendly solution. Thank you! Great job. Haven’t seen a bug since company sprayed. Very satisfied. Attentive, personalized, responsive service and team. Our tech, Louis, is fantastic and knows just where to treat to keep the pests at bay! Routinely come 3-4 times per year, but will come in between regular visits for any additional problems. Last year, had a bee's nest in my bathroom vent. Bathroom was FILLED with bee's! They came the same day at no extra charge. Highly recommend their services! !